Although she just turned 15 early this month, Derry girl Lauren Burton has the fashion and modelling world at her feet after being announced as the ‘Face of Fashion Fest’ for 2018. Another Derry model Sophie Read is the runner up for the prestigious title which is attached to the North West’s biggest fashion industry event of the year at the Guildhall on Saturday October 13th. Lauren will receive the perfect gateway into the industry with a one year contract with Style Academy Model Agency. On top of the contract, she has been awarded a host of other prizes including a year’s free haircare with Atchison Hair, VIP access to Fashion Fest for her and two guests, Rosemary Wright Makeup and brushes and a Bella Mia ‘Velvet & Oud’ gift set with a piece of sterling silver jewellery from the Zohara or Darcey collections. A GCSE student at Lumen Christi College in the city, Lauren’s interest in a career in the industry grew after attending a modelling workshop locally. “I am honoured to be selected as the face of Fashion Fest 2018 and I look forward to an exciting year ahead,” she said. “As a teenager I have always had an interest in fashion and make-up, I enjoy watching America’s Next Top Model and following beauty bloggers on Instagram. “I first became interested in modelling when I attended a ‘Model Behaviour’ workshop run by photographer Catherine MacKenzie and Make-up Artist Rosemary Wright. “It was an inspiring and memorable experience, so I decided to take a shot at modelling. Although her modelling career is gathering encouraging momentum, Lauren is keen to continue her education to have something to fall back on. “My education is very important to me and I hope one day to study medicine,” she revealed. “I would also love to model and feel this award will boost my profile and take my modelling career to the next level. 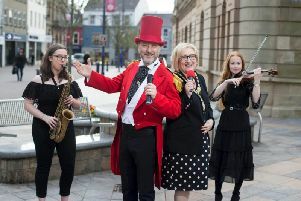 Business Development Manager with Derry City and Strabane District Council, Louise Breslin, said she was delighted to give a platform to young up and coming models through Fashion Fest. “The ethos of Fashion Fest is to support the local fashion industry by showcasing the best of local emerging and established talent so we are delighted to award Lauren the opportunity to progress her own career in the industry as our face of the event,” she said. “We were overwhelmed with the volume and standard of the entries this year and it was a difficult decision for the judges but Lauren and Sophie’s applications stood out and we hope the win can lead them on the pathway towards a career in the modelling industry. Tracey Hall from Style Academy added: “We are delighted to welcome Lauren to our agency and give her the opportunity to boost her profile and career over the next 12 months through her involvement in Fashion Fest and other local events. “We are proud to be working in partnership with Fashion Fest to celebrate the best of local talent and offering a platform to showcase it. Celebrity stylist and esteemed fashion designer Kate Halfpenny will be closing the show with her luxury brand Halfpenny London. Purchase tickets online now at www.derrystrabane.com/fashionfest or Eventbrite. Tickets can also be purchased from Guildhall, Derry and Alley Theatre, Strabane. Follow @fashionfestderry on Instagram for regular updates.